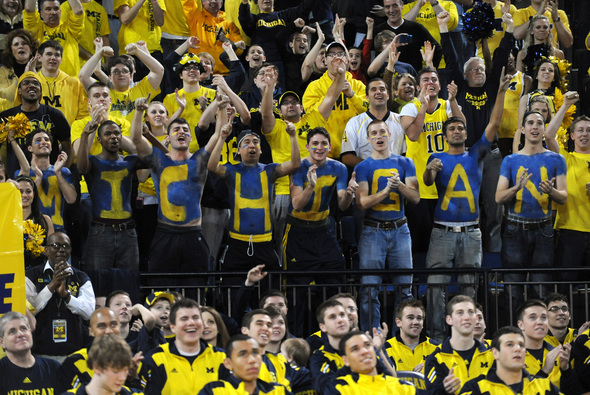 Michigan basketball fans cheer at Crisler Arena as they wait for a placement announcement during the 2011 "Selection Sunday" for the NCAA tournament. More than $3 million and 1,200 additional donors. That's the difference between a mediocre sports season and a comeback one at the University of Michigan. After three consecutive years of struggle and the hiring of a new coach, the Wolverine football team went 11-2 last year, while the basketball team just finished its winningest season in the Big Ten since 1994. The wins elated fans as hundreds of donors either gave to Michigan for the first time or found the school again after a rocky, short-lived Rick Rodriguez era. "When you have winning teams, things increase. The data that we are looking at right now is showing that," said Chrissi Rawak, senior associate athletic director for development. "A lot of giving has to do with people feeling good about the program." 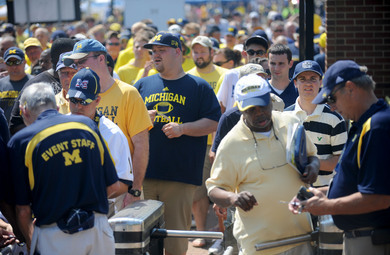 University of Michigan fans pack into the gates at the Big House for the season opener football game last September. Between July 2011 and February 2012, the athletic department received $29.6 million in donations, up 12 percent from the $26.5 million collected during the same period a year earlier. The number of donors also increased, rising from 15,280 during the first eight months of fiscal 2010-11 to 16,440 during the first eight months of fiscal 2011-12. The uptick isn't a coincidence, according to Rawak. She says that there's "no question" that the string of Wolverine wins contributed to the extra cash. "Conversation among alumni is that they are excited about the football team doing better, the basketball doing better. Athletics is always a big point of pride for them and something they respond to," said U-M Alumni Association representative Brad Whitehouse. "There's more interest this year, but there's still that core group. There's always more interest when the team is doing well," Whitehouse said. "But it's not like a night-and-day thing." Athletic department fundraising totaled $34 million in fiscal 2010-11, when the football team went 7-6 in 2010. Fundraising that year accounted for 28 percent of the athletic department's budget. Most of the department's other revenue comes from football, basketball and hockey. Those are also the sports that tend to excite donors the most, Rawak said. That same year, Big Ten rival Ohio State University went 12-1 and raised $40.8 million, or 17 percent more than U-M. Ohio State football went 6-7 in 2011 and has raised $22.7 million since the fiscal year began in July. U-M athletics has a $3.8 million, 14 percent fundraising lead on Ohio State. Although Rawak and a number of fundraising experts believe performance has an effect on fundraising, most say it's difficult to quantify. "The research shows that it can have some impact, but it's not a huge impact and it can be short lived," said Rae Goldsmith, vice president of the Council of Advancement and Support of Education. "There are just so many factors beyond athletics that can be influencing fundraising, so it's really hard to tie a gift to (something specific)." At U-M, for example, the athletic department development team, under second-year athletic director David Brandon, has restructured the way it operates in an effort to improve efficiency and donor connectivity. Other influences can include the economy, facility improvements and events that generate donor interest, turnover in coaching positions and factors that raise or lower the profile of a university. Fundraising at Ohio State, for example, may be dipping not only because of the school's field performance, but also because of the aftershocks of NCAA violations and veteran head coach Jim Tressel's 2011 resignation. 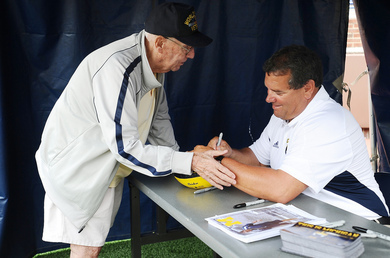 Brady Hoke greets a fan. Coaches —their likability, performance and ability to connect with donors— can have a significant impact on development, Rawak said. "People give to people they connect with. If you have a special connection with a coach... that matters," Rawak says. "If you have constant turnover, it's challenging." The Michigan football program received criticism and heavy scrutiny under Rodriguez, including eventual NCAA violations. In contrast, first-year coach Brady Hoke has received a generally positive reception at U-M.
"Alumni care a lot if the football team is not doing well. The three years when Rich Rod was coaching, it was hard on alumni. But I think in a lot of ways they're not really fair-weather fans either," Whitehouse said. "But it's not like people were as excited going to the bowl game that Rich Rod went to versus the Sugar Bowl." Large donations, Goldsmith said, can also skew trends. Goldsmith said a winning season itself isn't likely to change donation levels significantly unless a school's athletic department capitalizes on wins. "They can use the visibility they gain to build engagement and repeat engagement over time does lead to growth in giving," she said. "You can't rely on a onetime athletics success. You have to keep engaging people even after the event and that’s more likely to lead to long-term fundraising success." That's the sentiment of Nikki Borges, director of development for Eastern Michigan University's athletic department. "Good news makes people feel good about supporting a team," Borges said. "But that enthusiasm doesn't necessarily turn into dollars over night." The EMU football team went 6-6 last season. While that may not constitute a winning season, it's the highest win average the Eagles have enjoyed since 1995. The wins, however, haven't led to an immediate increase in donations to the athletic department. The school has actually seen a decrease in donors and donations this year, which Borges says is in part due to staffing changes at the development office. Between July 1 and January 31, EMU athletics raised $321,000 from 791 donors. During that same period a year earlier, the school raised $577,000 from 932 donors. EMU President Susan Martin said she doesn't think it will be long before Borges and her development team can begin capitalizing on recent successes. "It's been many years since we've been competitive in men's basketball and football. We have 140,000 alumni and I think there's a real urge to see success in the programs that many people follow," she said. "It's something that will just bring attention to the university ... but I think we'll have to watch it over time because we're just beginning to be competitive." Mon, Apr 2, 2012 : 1:45 a.m. The Good News: None of the 1,200 additional donors were of the tattoo parlor or used car dealer variety. The Bad News: The tattoo parlors &amp; used car dealerships keep sprouting up over the Columbus, OH area and in overflowing the OSU's coffers. GO BLUE! Sun, Apr 1, 2012 : 9:23 p.m.
Brady Hoke ad John Beliein didn't do anything to earn these dollars. Pay the athletes. They are ones responsible for the ash cow at UM. Not Mary Sue Coleman, Brady Hoke who just happen to fall into a gold mine or J ohn B. Too bad. Rich Rod had the inapproriate last name. Sun, Apr 1, 2012 : 9:45 p.m. If that is your position, I guess all the wrestlers need to give their scholarship money back since they didn't EARN a dime. They COST the U money. Also every other athlete that gets a scholarship that does not produce a profit needs to start paying. Ridiculous and illegal, but don't let that change your opinion. By the way, if you believe a coach does not make a difference, then how come the same coaches tend to win and produce professionals all the time? Sun, Apr 1, 2012 : 3:25 p.m.
Sun, Apr 1, 2012 : 3:22 p.m. When Dave Brandon let Brady Hoke hire Greg Mattison- that was the best $750,000 Michigan ever spent. Dave Brandon is a great AD. Sun, Apr 1, 2012 : 3:02 p.m.
Sun, Apr 1, 2012 : 2:58 p.m. The real irony is that the Athletic Department raised ticket prices for U of M home football games. It is very nice to know that there are more donors and they gave more money so this really does not justify the recent news about higher ticket prices. I know both the football revenues and donation funds will be put to very good use. My point is that I would like to see the Athletic Department hold the line on higher ticket prices for a year or two. My expectations are low but may seem very unrealistic to some. I am sure we'll see even more donations as well as higher ticket prices in the next few years. Success breeds success and I don't want to see any setbacks. Sun, Apr 1, 2012 : 1:34 p.m. Funny thing. It's ALWAYS about the Money. Well. That Pride and Vanity. Sun, Apr 1, 2012 : 6:24 p.m.
Yeah. You're right. Hey whats Fitz Toussaints grade point average up to these days anyhow. I don't see it in the stats. &quot;rolleyes&quot; Come off it. Sun, Apr 1, 2012 : 2:18 p.m.
Not to mention the 500+ students that are given the opportunity for a free education at one of the leading universities in the world, so there's that. Sun, Apr 1, 2012 : 1:21 p.m.
How philanthropic. I couldn't imagine a more noble program to donate to than one designed to indoctrinate our youth to pledge blind partisan loyalty, to wear the colors and stand behind your party/team regardless of thier faults or merits, and condition them to fall in with mob mentality and despise any other team we meet with, so that we may crush and shame them, and prove ourselves to be the victors. What a great cause to support. I suppose you could also have thrown that money toward a high school baseball team to rebuild their field, or donate jerseys and nets to a struggling underfunded school's soccer or basketball team, or even to some community sports league that emphasizes teaching old fashioned good sportsmanship to our youth, but where would the pride be there if you weren't supporting your alma mater? Sun, Apr 1, 2012 : 3:46 p.m.
How much money did you donate toward rebuilding a baseball field? How many jerseys did you donate? How can soccer be underfunded? A ball costs $25 bucks. How many balls did you donate? I'll tell you what, donate a ball and mow the field. Problem solved. Yes Bill. I personally view common sports fan mentality as largely mindless and vain. Yes, I personally think that this culture conditions youth toward a mentality of blind partisan loyalty. Yes, I see modern sports culture largely as a destructive contributor to society, and on the whole about as unsportsmanlike as you can get. Yes, I am repulsed by the notion that 16,000+ people would rather contribute tens of millions every year to an already gluttonous sports program, while poorer kids in public schools are having to pay to play. And we all know that criticizing people's choices is exactly the same thing as resenting freedom of choice, and therefore is rock solid proof that Obama wants to crush our free society and take these choices away. I guess I've been outed. Sorry for oppressing you. Go Wolverines. Sun, Apr 1, 2012 : 2:17 p.m.
Until Obama and the progressives accomplish their end game this is still a free society in which people can decide for themselves what to do with assets they earn from many hours of hard work. You seem to resent freedom of choice. Sun, Apr 1, 2012 : 1:36 p.m.
Sun, Apr 1, 2012 : 11:58 a.m.
what is the source of your numbers? In particular the Ohio State numbers? Sun, Apr 1, 2012 : 1:48 p.m.
Sun, Apr 1, 2012 : 12:06 p.m.
U-M's numbers came from the U-M Athletic Department, Ohio State's numbers came from the Ohio State University Athletic Department. Same with Eastern. Michigan State's Spartan Fund did not respond to a request for numbers. Thanks for reading. Didn't you just have a story yesterday about how the athletic department was raising ticket prices for next season? Funny how these two things are related. Sun, Apr 1, 2012 : 10:37 a.m.
AAH, the sweet smell of the blessed excrement greenbacks being spread compostumously around lovely Treetown each Fall.. too bad that Sportsfans aren't as Socially conscious towards the Arts, Education &amp; Green Energy as they are the Almighty pigskin..
Sun, Apr 1, 2012 : 1:51 p.m. It's also too bad that those that are &quot;socially conscious&quot; do not spread their excrement greenbacks towards the arts, education &amp; green energy. Sun, Apr 1, 2012 : 12:53 p.m.